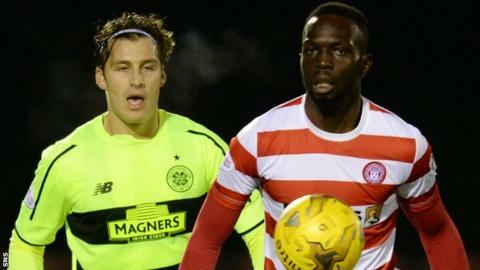 Oumar Diaby is hoping to pay back Hamilton Accies for their welcome after suffering what he claims was racist torment in Slovakia and Bulgaria. The 26-year-old French forward joined Hamilton in February after leaving Levski Sofia. "Since the first day I came to Accies, the guys here have tried to help me. "In my old clubs back in Slovakia and Bulgaria, it wasn't like this. I would go in for training and no-one would speak to you," said Diaby. He continued: "In those countries, it is difficult to live. They don't see a lot of black guys." Prior to his move to Bulgaria, the one-time Real Sociedad youth spent three years with Kosice in Slovakia and claims he was met with racial abuse at every ground he played at - even being targeted by his own club's supporters. "Bulgaria in the beginning was okay," he said. "It wasn't like Slovakia, where there are a lot of racist people. "In Slovakia, though, it was hard. I would hear monkey noises every week, even from my own fans. It was awful. "I did a lot for Kosice. I scored in the quarter-final of the Slovakian Cup then the semi and the final. "After that, we played in the qualification round for the Europa League and scored then too. "So I gave them a cup final and Europa League football - but later, when I missed a penalty, I had to delete my Facebook account because the abuse I was being sent was so awful." Diaby joined Levski in Bulgaria's top flight last year. "In Bulgaria, there was maybe three or four black players and we just stayed together," he said. "I was already thinking about moving to the UK or France. When I got the chance to come to Accies, I was so happy. "I know I will not have to put up with that sort of thing here in Scotland. "I know, if I'm playing bad or good, the fans will help me. It's a different mentality here. "It's a big victory for me to be here. Now I can enjoy my football." Diaby, who signed until the summer, has only made two fleeting appearances as a substitute for Martin Canning's team but is desperate for the chance to help Accies clear of relegation trouble. "The style of football is very different here to Bulgaria, but I'm very happy to be here," he added..
"Now I'm just waiting for my chance to play and show what I can do."